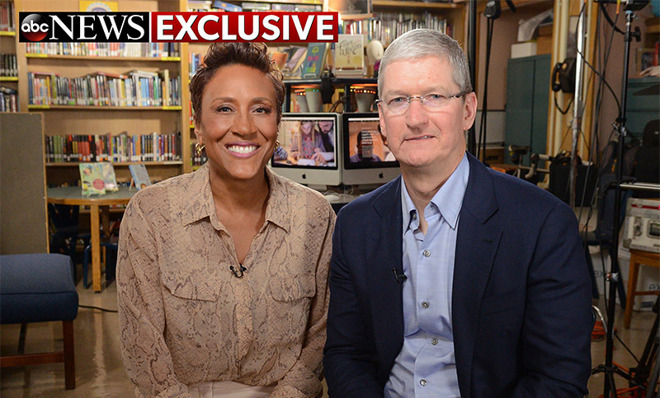 In an exclusive interview set to air Wednesday, Apple CEO Tim Cook goes one-on-one with Robin Roberts of ABC's "Good Morning America" to discuss a wide variety of topics including last week's product announcements. ABC posted a short promotional clip of the full interview online on Tuesday (via Yahoo), strangely opting to focus on consumer fears that Apple's new AirPods wireless headphones might fall out of users' ears during strenuous exercise. Roberts told Cook that ABC News correspondent and former professional football player Michael Strahan was convinced he would lose his pair of AirPods in short order, but the Apple chief quickly assuaged those concerns. "I've been on treadmills, walking, doing all the things you normally do," Cook said. "You know how you walk around with the earbuds and they're constantly getting caught on something? You never have that problem." Further, Cook notes AirPods' lack of wires cuts down on weight that commonly dislodges earbuds with cables. The interview, taped at a school in Harlem in New York City, is thought to be one of the first Cook granted after unveiling a slew of new products at a special event in San Francisco last week. Considering the setting, Cook might also talk about Apple's ongoing education program. At the iPhone 7 event, Cook detailed progress on Apple's contribution to the White House's ConnectED initiative, noting that 4,500 teachers at 114 partner schools in the U.S. will receive Mac, iPad and Apple TV hardware this fall. The company is also donating 50,000 iPads to students.